Served with red persimmons or ripe bananas, Com – Special Autumn gift is truly delicious. 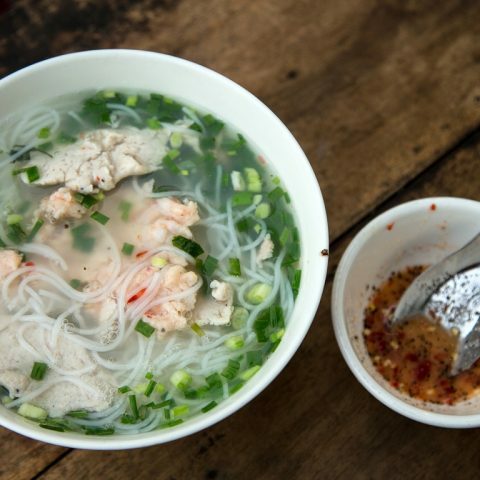 Vong Village, on the outskirts of Hanoi, is expected to produce the best Com in northern Vietnam. 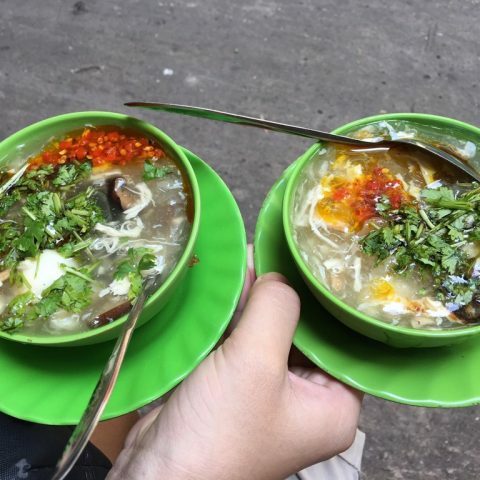 When autumn arrives, Hanoi everywhere always remembers Com special taste that is a special gift of the earth made by working peasants, with a simple and fresh aroma. Each autumn, when the cold north-westerly wind brings a cold dew, sticky rice ears are folded into mature grain waiting arcs because these rice grains are in full bloom and the rice milk is already concentrated in Cereals, farmers know it’s time to make Com – a specialty made from young sticky green rice. Com is often eaten by hand, directly from the lotus leaves, one pinch at a time. When you eat Com, you must slowly appreciate and chew very deliberately to enjoy all the perfumes, tastes and plasticity of the young, sweet and butter rice. 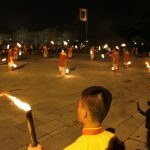 Visitors to Hanoi during the Com season are invited to go to Vong Village where they will have the opportunity to hear the special rhythm of the wooden pylons against the mortars filled with young rice and see the women changing and vomiting young kneeling rice. In Vong village, making Com used to be a common trade. People from Vong village are said to have the most complicated process for making Com. Firstly, glutinous paddy is planted. 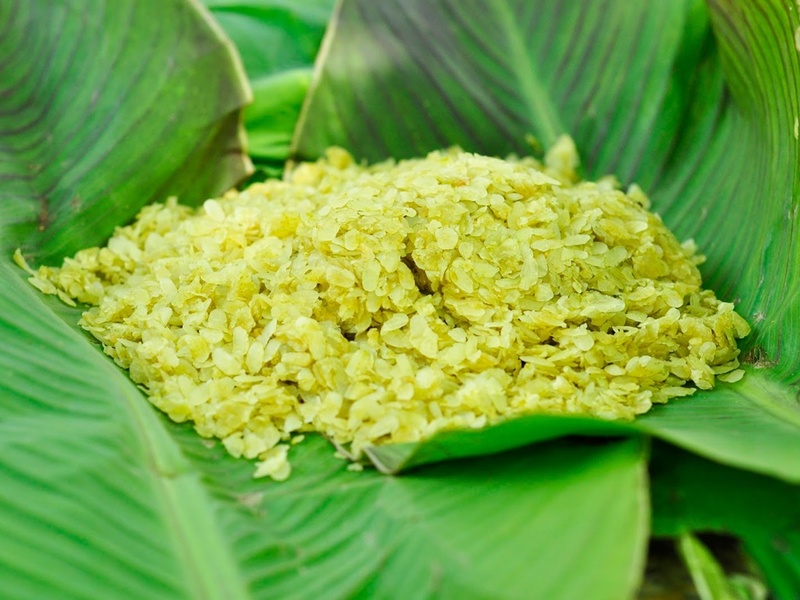 To produce their famous Com, residents of Vong village grow a special variety of sticky rice. The sticky rice must be harvested at just the right moment. When the paddy begins to ripen and still contains milk it is reaped but only at early dawn. The rice is plucked off manually so that the grains are not broken. Next, the choice grains are carefully selected, sifted and washed. At night, the grains are dried in a large pan over a soft fire and then pounded in stone mortars. Following this, the young rice is removed from the mortar and winnowed before being poured again into the mortar and the process repeated. This is then repeated exactly seven times so that all the husk is removed from the young sticky grains. There is an art to this part of the process. 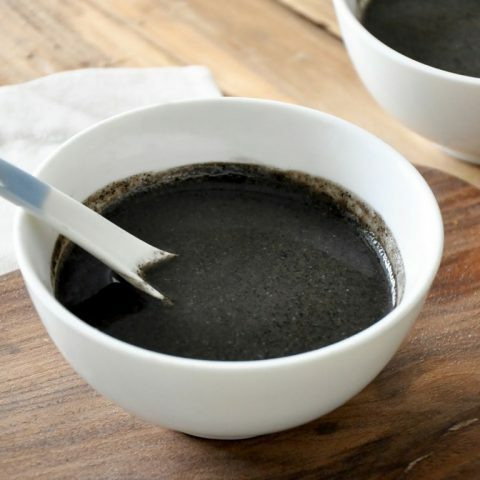 If the pounding is done irregularly and in haste, or it is not repeated seven times, the green color of the grains will disappear and be replaced by an unexpected brown colour. Then the whole process will have been to no avail because customers will refuse to buy such produce. This should go some way to explaining exactly how difficult the whole process of Com making is. “Not everyone can dry and pound Com. It is a closely guarded secret in some families that is never revealed to the mothers or daughters!” says 72-year-old Pham Thi Nguyet, whose family still produces Com. 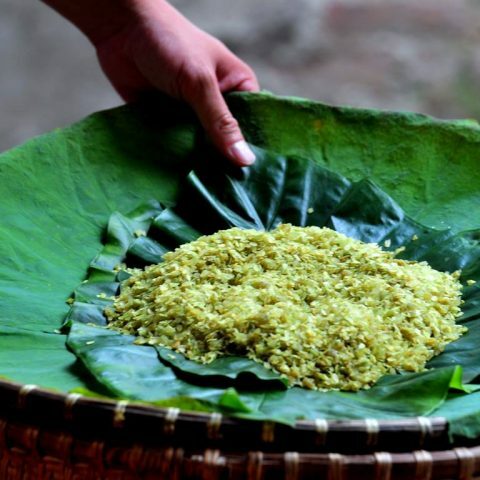 After the Com has been pounded, the crystal spring rice is wrapped tightly in emerald lotus leaves to keep it from drying and allowing it to absorb lotus flavor. Better than any other person, peasants are the only ones who truly understand when the rice ears are ripe enough to be reaped to begin making Com. From then on, Com is still available, however, as it is used in different local specialties. 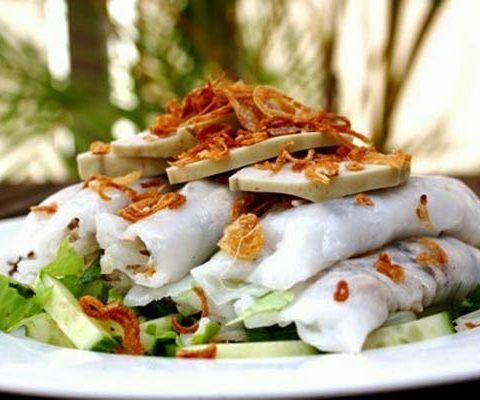 Com is an ingredient used in many specialties of Vietnam, including “Com xao” (browned green sticky rice), Banh com (green sticky rice cake) and “Che com” (sweetened green sticky rice paste) and so on. Banh com (Com cake) is the well-known as it is found at every engagement ceremony. The cakes are wrapped with bananas leaves into squares, tied with a red string and stamped on the outside with a Chinese character meaning “double happiness”. 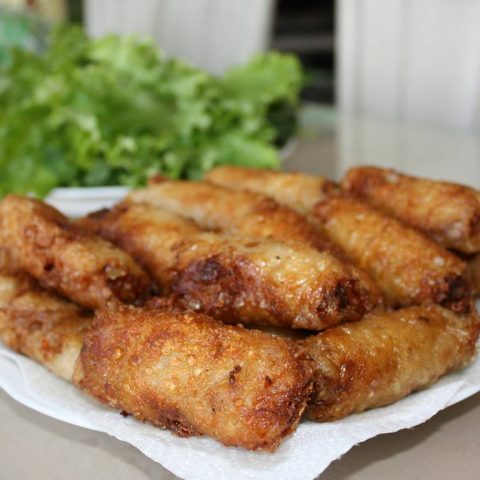 With these characteristics, Banh com is believed to be a symbol of steadfast and eternal love. Green sticky rice cakes are sold on Hang Than Street. Sticky cakes stuffed with green rice are sold on Hang Dieu Street and Quoc Huong green rice paste is sold on Hang Bong Street. Restaurants also offer dishes involving Com, such as chicken stewed with herbs and green rice, or green rice served with fried shrimp. Nowadays, thanks to convenient means of transport, many Hanoians send Vong Village’s Com to their relatives in other parts of the country, and even abroad, as a special gift. By this way, the delicious taste of Com always stays in the hearts of Hanoians wherever they live. To those who have ever been involved in farming, eating Com often reminds them of a fresh and fragrant paddy.